The majority of workplaces are now smoke free, and the percentage of Americans who smoke is in decline. According to the Centers for Disease Control and Prevention (CDC), however, nearly 38 million, or more than 15 percent, of Americans still smoke. Cigarettes and their new friends, e-cigarettes, are “the leading cause of preventable disease and death in the United States, accounting for more than 480,000 deaths every year.” While smoke-free workplaces greatly reduce the risks of secondhand smoke to nonsmoking employees, employers are still paying for the damage that smoking does. This includes absenteeism, lower productivity, extra health care costs, and additional worker’s compensation. Smoking can also increase the risk of fires and accidents. For employers, smoking hurts the bottom line. On average, smokers take two sick days per year more than nonsmokers. According to a study conducted by Ohio State University, smokers can cost their employers roughly $6,000 per year on average. The biggest part of that cost is lost productivity due to smoking breaks, distraction, and sick days, followed by increased health care costs. Smoking makes people more vulnerable to acute illnesses such as bronchitis and pneumonia. In addition, smoking increases the risk of more serious and chronic diseases such as cancer, chronic obstructive pulmonary disease (COPD), heart disease, and stroke. Employees with COPD, for example, may miss about 4.5 days of work per month and cost employers about three times more than employees without COPD. The financial drain of smoking provides a good reason to try a smoking cessation program at work. There is another reason as well: Smoking cessation programs offer a good return on money spent, being more cost-effective than some other health intervention programs, for example those focusing on reducing cholesterol or high blood pressure. A smoking cessation program can be scaled to the workplace and its budget. A program may be as small as sharing some information with employees or as large as an in-house program carried out by consultants. Any day is a good day to quit smoking, but the third Thursday in November has been singled out by the American Cancer Society for the Great American Smokeout. Smoking cessation programs may also be rolled out in January, as employees make resolutions for the new year. Since quitting smoking may take several attempts, it also makes sense to promote cessation programs more than once a year. Four sessions of counseling of at least 10 minutes per session. Counseling may be group, individual, over the phone, or over the internet. Counseling and group support have been found to significantly increase the odds of quitting successfully. This may seem expensive, but money spent on a cessation program can be recouped through reduced health care costs, and costs may be reduced or eliminated through partnerships. A partnership with your health care provider. If you have a health care provider, a computer search and/or phone call or two may be all that’s needed to get started on a partnership, since many health care providers have cessation programs ready for participation. Phone apps. Today, many people live through their smartphones, and many free apps are available to help people quit. A partnership with other agencies. A local YMCA, for example, may have a cessation program. 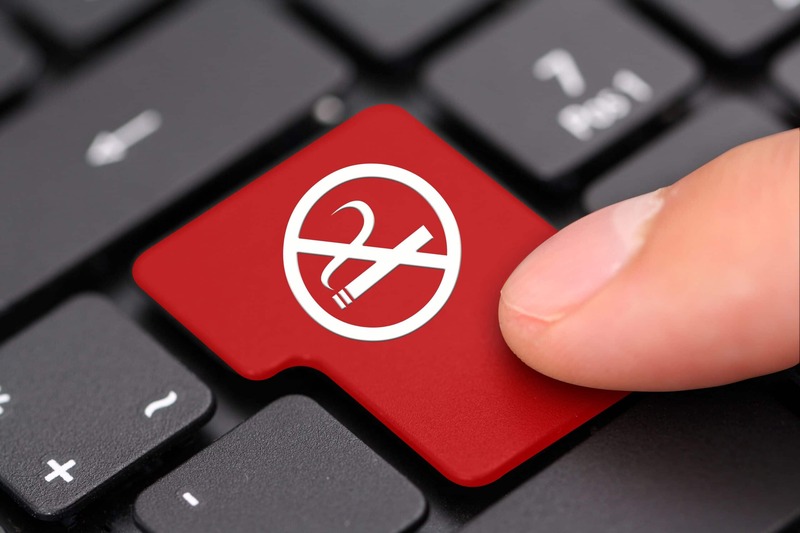 There are also various online platforms, including the National Alliance for Tobacco Cessation’s becomeanex.org and QuitNet’s quitnet.meyouhealth.com. These online platforms may also offer apps. Incentives. PTO, break times (including break and lunch times centered around quitting), and other incentives can encourage employees to quit. Alternative methods, including acupuncture, yoga, and meditation. Getting family involved. Employees are not just trying to quit smoking at work. They are trying to quit at home too, and it can be of great help if every smoker in the family joins a cessation program. Cessation programs may be voluntary, largely involve time off work, and cost the employee nothing. (In fact, quitting can put money in an employee’s pocket. The CDC places the cost of a pack a day at about $188 per month or $2,292 per year.) Even so, there are some legal issues to consider. Federal and state laws place some limits on how much “stick” (for example, surcharges) an employer can use to encourage employees to quit smoking. Depending on the number of employees an employer has, as well as other factors, applicable federal regulation and law include the Market Rules and Rate Review Final Rule (45 CFR Part 147) and the Protecting Affordable Coverage for Employees Act (Pub. L. 114-60). In short summary: Employers cannot charge employees who smoke more than 1.5 to 1 for their health insurance in comparison to “similar individuals who vary in tobacco usage.” However, a “state may use a narrower ratio.” States that have reduced the surcharge limit include Arkansas, California, Colorado, Connecticut, Kentucky, Massachusetts, New Jersey, New York, Rhode Island, and Vermont. According to one study: “Overall, 47 percent of employers used tobacco surcharges but failed to offer tobacco cessation counseling. Wellness program prevalence was lower in states that allowed tobacco surcharges, and 10.8 percent of employers in these states were noncompliant with the ACA by charging tobacco users higher premiums without offering cessation programs.” Employers who only apply a surcharge without offering a cessation program are using only a stick but no carrot. While surcharges may be legal and cessation may only be recommended (depending on the program and provider) cessation is a relatively cheap way to reduce healthcare costs. As long as an employee participates in the cessation program, the employer may not penalize the employee for using tobacco. Only if the employee fails to participate in the cessation program is the employer allowed to increase the employee’s health care premiums or impose another financial penalty. The employer may not set a deadline by which the employee must give up tobacco use. In addition, twenty-nine states and the District of Columbia have what are called “smoker’s rights” laws, which limit the power of employers to compel employees who smoke to quit. These limits include surcharges and how they may be applied. Common sense and the law encourage the use of the carrot as well as the stick in changing behavior. Smoking cessation programs are relatively cheap and effective ways of encouraging employees to quit smoking. While surcharges may be available, they should not be used alone.